We want you to thoroughly enjoy your visit to our farm so please take a minute to review the following information and policies. Please contact us if you have any questions. In severe weather conditions, certain attractions and possibly the park itself will be closed for safety. Check our website or facebook page for current updates. To maintain a family type atmosphere at Harvest Moon Acres Corn Maze & Fun Park, we require that our guests be dressed in accordance with the standards set forth here. Harvest Moon Acres Corn Maze & Fun Park reserves the right to refuse admission to anyone who refuses to comply with our dress code standard. We are a family farm - please dress accordingly. Clothing that might offend other guests is not allowed (within certain guidelines). Shirts and shoes must be worn at all times. You are visiting a real farm. We recommend wearing clothing comfortable for walking or hiking. Use hats for sun protection. Pay particular attention to footwear. Chances are good you'll get a bit dirty, so choose your shoes wisely. Alcoholic Beverages - NO alcoholic beverages are permitted at all, ever. Smoking or Tobacco Use - NO smoking or tobacco use on premises. We want to maintain a clean farm with clean, fresh air for all of our guests to enjoy. We thank you in advance for your cooperation with this policy. Laser Pointers - For safety reasons, laser pointers are not allowed at Harvest Moon Acres Corn Maze & Fun Park. Other - Other prohibited items include glass bottles, knives, fireworks and explosives, firearms and ammunition, and barbeques or grills. Line-Jumping - No line jumping. Please be courteous of other guests. Profanity - Profanity and unruly behavior are offensive to park guests and may be cause for ejection without refund. Child Supervision - Children should be supervised by parents at all attractions at all times. For your convenience and enjoyment, we operate a concession stand, including drinks, on the premises. Pets, even well behaved ones, are NOT allowed entrance to the farm. Service animals are welcome at Harvest Moon Acres Corn Maze & Fun Park. All service animals must remain under control and refrain from disturbing our guests, employees, or animals. We stock standard First Aid supplies similar to the kind found in First Aid Kits purchased at discount stores. We can provide supplies to a guest or guest's family member, but only third-party trained staff can apply Band-Aids or assess injuries. If the incident warrants more assistance than we or the family can supply, we will contact the appropriate emergency personnel. We DO NOT under any circumstances dispense any medications. We have restrooms available for your convenience. We've done our best to provide smooth pathways for you to walk on but these pathways can still be uneven or slippery, especially after a rain. All-terrain strollers or wagons for your kids work well. Wheelchairs are welcomed but users may experience difficulties accessing all areas of the farm. If you have any questions about our facilities, please contact us prior to your visit. Cash is preferred but for your convenience, we accept Visa, Master Card, and Discover cards. Group leaders may pay with corporate, school, or scout troup checks for group admission. For directions to our farm, click here. We have plenty of FREE parking and bus parking spaces for groups. Please note, all groups should pre-book their visit. To reserve your spot, contact us today. 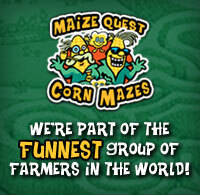 You must wear your Harvest Moon Acres Corn Maze & Fun Park wristband throughout your visit to the farm. Re-Admittance is ONLY allowed with the wristband. Failure to comply with the guidelines set forth will result in dismissal from the farm without refund of admission.